When you spend money, you are also spending time along with it, but when you spend time you are not necessarily spending money. Money is Time. Time is not always Money. Most human creation usually costs money. Most creation by Mother Nature usually is free for us to take and use wisely. The following "Time Currency" from ever-present "Kingdom of Time" are monetarily non-negotiable time currency collectibles which can be converted mainly into/from time, goods, labour or services by a wide variety of ways, factors and mutual agreements. 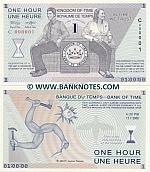 So far the first 100 notes were issued with serial numbers C 000001 through C 000100. Unique pieces with unique date and time of issue. Time is Money!